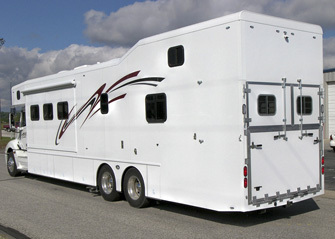 The Equine Hauler was designed by Swan Creek, built by ShowHauler. The horse enthusiast, the young family traveling to horse shows, and even the retired couple who enjoys trail ride trips will all appreciate this unique horse hauler. The full living quarters up front and separate equine area in back allows for 1–3 horses plus tack on your trips away from home. The two basic layouts reach different needs as you travel. However, if at times you tend to haul more horses, more tack, and more feed, hook up to a trailer and utilize the space with in your coach for extra storage. The manger, watering system, ventilation, and high quality materials used with in the stalls will help keep your horses safe and comfortable on the trip.